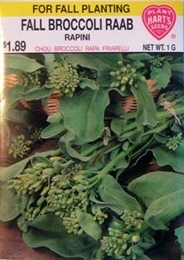 This over-wintering broccoli produces a liberal cutting of turnip-like leaves and small tender flower buds which are used for greens. For fall greens, Plant in mid to late summer. For early spring greens and flower buds, Sow in mid to late fall. Bulk Fall Broccoli Raab seed available. 2lbs of Fall Broccoli Raab seed needed per acre, 4oz needed per acre if using transplants. Normally, 1oz of seed can produce 3000 Broccoli plants.